Pre-game baseball practice: How to maximize pregame time with drills and skills. the Most Out of It? Pre-game baseball practice should be used for full-scale skills and drills practice time. 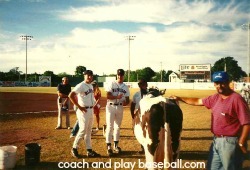 Many baseball coaches under utilize the time before baseball games to teach fundamentals. Often little planning goes into pre-game baseball practice plans. Or, very little energy is put into coaching prior to the games. Or, some coaches just do not know what practice drills to use. I watch many youth league baseball teams prior to the ball games. I cannot believe how few times the players actually touch the baseball. Often the players will mosey on out and pair off and toss a few throws back and forth with little or no instruction from their baseball coaches. The starting pitcher and catcher may wander over to the bullpen area and throw some warm-up pitches often with little or no pitching or catching instruction near the pitching mound area. An assistant coach might fungo a few fly balls and ground balls to a long line full of players mostly standing around waiting for their turn. If there is a batting cage around the youth batters will wait in line and one at a time take a few swings off a coach pitch. Overall, minimal amount of ballplayers handling the baseball. Most youth baseball teams rarely if ever conduct baseball practice. Ball players do not get to catch and throw the ball enough in practice drills or games. 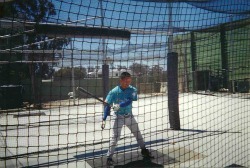 Rarely do hitters take batting practice or get to swing the bat. This is one big reason why it is imperative to use the pre-game practice hour or whatever you have to spend on practice drills and skills. Let’s say your team plays 16 games in a season. 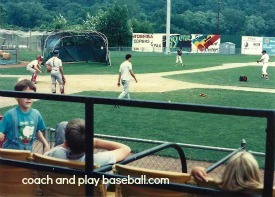 That could be 16 hours of intense baseball practice drills for your players. When the games start most of the players on the team will not handle the ball that much anyway especially if the first baseman is lollygagging out to the field between innings and the outfielders do not throw between innings. Baseball teams can easily establish a baseball pregame routine. A good efficient pre game baseball routine should include practice in all the important skills needed to play baseball well. Pre-game practice should contain throwing and catching drills, fielding and throwing drills and batting practice swings. With one hour and a good simple plan for baseball pre game a team can cover infield drills, outfield drills, throwing warm-up drills and some batting practice hitting. Pre game baseball drills can be so much fun and fast paced that players do not realize they are actually working pretty hard. Try some of these baseball pregame warm up drills and watch your team’s baseball skills improve. 1. Report 1 hour prior to game time. Use whatever time you have to maximize your pre game warm-ups. If it is 45 minutes or 30 minutes then get busy. 2. Get loose quickly. Get a quick jog and stretch your muscles. Most of the warming up comes during the pre game practice. 3. Get paired off; line up parallel with everyone throwing the same direction. Spread out playing catch with a partner with plenty of distance between others. Always keep safety in mind. Catch and throw for 10 minutes minimum. Include long toss (at least twice the length of the bases and more). Use the Finish with the Also, use the and the Relay drill. shuffle and throw throwing footwork, the bow and arrow throwing motion. Hot Potato ‘fast catch throwing drill’. Finish with the Kit-Kat-Catch Game. Or, use the and the Relay drill.Practice good throwing mechanics with the Half-Throw throwing drills for pitchers and players. 5. Batting practice routines. Using whiffle balls, batting tee, soft-toss, tennis balls, pepper there is really no excuse for not being able to get everyone at least 15 or more swings in the batting practice drills. 6. If you have access to a batting cage enclosed tunnel make sure you have multiple stations going on. Having one hitter batting and the 10 or 11 players standing in line you are wasting way too much down time. Use part of the netting for soft toss, t-ball practice, and bunting. Break into groups of 3 or 4 players and take 5 minutes in each station. Each player gets one full minute in the ‘live cage’. 7. Set up an infield during pre game with ‘throw down’ bases in a grass area (carpet samples work pretty good). Work the ‘Rapid Fire Fungo Drill’ with all the infielders. Practice throwing to firstbase, double plays, slow rollers, review bunt defense, pitchers covering firstbase, popups priority and 1st and 3rd defense. Even rundowns can be part of the baseball skills practice routine. 8. Spend 10 minutes on the ‘Rapid Fire Fungo Drill’. ‘Rapid Fire Fungo Drill’. 9. Use the ‘Fun-On-the Run’ Drill for catching fly balls on the run with your outfield baseball drills. Baseball players will get warmed up real fast with outfield drills. 10. Never stop and sit on one knee or go to the dugout and stare at the opposing team while they are taking infield outfield practice.This serves no benefit in helping improve your baseball skills and it wastes time away from a fine pre-game baseball hitting game called ‘pepper’. Go over the offensive baseball signs. Defensive situation baseball signs. Baserunning situation do’s and don’ts. Duties for the extra players. and any other team messages to share with the players. 11. Always take pre-game on-field infield-outfield practice if time permits. Taking live groundballs and fly balls and making strong accurate throws are always good baseball skill practice. 12. If a game is going on before your game then find an empty field or area prior to the game. Do something. Anything is better than nothing. Improvise! Overcome! And Adjust! Use pre game baseball practice time to your team’s advantage. Maximize the time you have using a simple baseball practice plan template. Do not worry about getting the players too tired or too hot before the game. If you plan right and use the drills in a fast paced, quick transitions up beat style the players will not even realize how hard they are working out. Always remember—you are developing baseball players first, and winning is a second priority. Use the "developing players" mindset for ways to develop baseball players skills. Kids have to touch the ball, handle the ball, and hit the ball a lot to show a polished improvement when the game situations happen. Keep the direct instruction and the lectures short and sweet and get the kids in motion and action during the pre-game.